Traditional Indian recipes, fusion recipes influenced by various cuisines, simple and easy recipes, fun recipes……its just yummmmminess…nothing serious ! There is nothing much to say about this recipe, actually there is nothing much to this recipe either :). 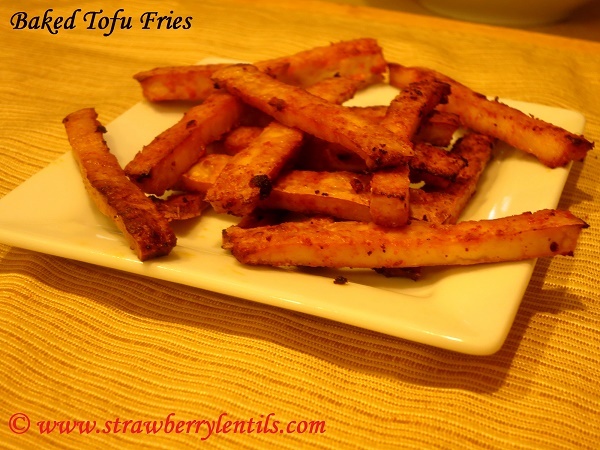 My kids love fries and they also love tofu. I have seen tofu responding very well to baking. So this recipe was a no-brainer, crunchy fries (just the way they want it) made with less than a tbsp of oil (just the way I like it 🙂 ). 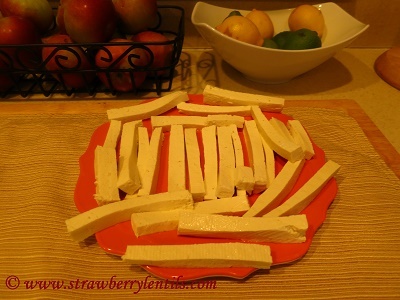 First cut the tofu into strips. If you prefer super crunchy fries, cut them very thin. I prefer crunchy on the outside and soft on the inside kind, so I did medium cuts. For the rub, I mixed red chilli powder, garlic paste, salt and oil. 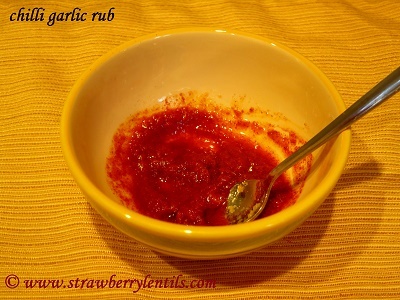 You can also grind red chillies and garlic cloves to make a fresh rub or use the store bought chilli garlic paste. Rub the chilli garlic mix on the tofu strips gently. Even the extra firm tofu breaks easily, so be gentle :). 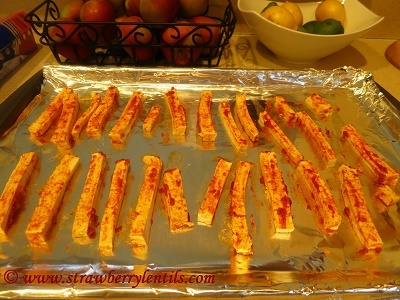 Line a baking tray with foil or grease the tray with cooking spray and place the tofu strips on the tray in a single layer. Bake at 425 degrees for about 12 minutes and then flip the strips and bake for another 8 – 10 minutes , until your preferred texture is reached. As I expected the golden crunchy fries were gone in minutes and the kids were complaining that I didn’t make enough :). Well, there is always next time :). Looking for a recipe ?